The Croatian cuisine is diverse depending on regions. For example, the cuisine in the region called Slavonija and around Zagreb, which are located closer to Hungary and Austria, have influence of Austrian and Hungarian cuisines. On the other hand, the cuisine in the coast region has influence from the Mediterranean and Italian food. So, in Croatia and here in Zagreb, you can find really nice Italian restaurants and pizzerias. And they are very cheap! Much much cheaper than in Japan, definitely. For example, at a standard pizzeria where local Zagreb people go, you can buy a middle size of pizza for about 35Kn, a 250ml bottle of coke is about 12Kn, and a small size of salad for about 15Kn. The middle size of pizza in Zagreb pizzeria is actually the same size as, or could be bigger than, a large size pizza in Japan. And a large size pizza in Japan costs over 30 euros! Many people think that everything in Japan is extremely expensive. But, it actually is not true. In Japan, you can find cheap food at Japanese-style pubs called Izakaya, on the other hand, you can also find high-end restaurants. Izakaya is a pub, but offers verious types of food in small plates, so you can try many different Japanese domestic food there. When I have dinner at an Italian cafe/izakaya with 3 to 4 female friends of mine, I spend about 25 euros on average including 2 glasses of alcohol beverage. Maybe it's not common outside Japan, or more broadly outside Asia, but we usually share plates. So, when I have dinner with my friends at the restaurants, we order a salad, a few appetizers, some small plates of chicken, a medium size of pizza (meaning, a small size of pizza here :)) and a past to share, and drinks and cakes for each. 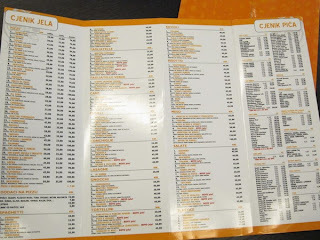 In Japan, usually, restaurants offers different menu between lunch and dinner. Prices for lunch is much cheaper than dinner even at a relatively expensive restaurant. Lunch at standard restaurants is in a range between 8 euros to 15 euros. You can also find a cheaper option at a chain Gyudon restaurant, such as Yoshinoya and Sukiya, where you can eat Gyudon (a bowl of rice topped with beef and onion) for less than 4 euros :) Gyudon is something like, pizza for Italian and hamburger for Americans. Anyway, going back to Croatian restaurants, I think prices of food at tourist destinations, such as Split, Dubrovnik and so on are higher than Zagreb by 20 to 30%.